Fishing is an i mportant part of the life at sea. We fish mostly for food, but it doesn’t mean we are not enjoying ourselves doing it. We’ll save the fishing stories for nice evening sipping rum on the aft deck and go on describing the way fish is caught on Karaka. 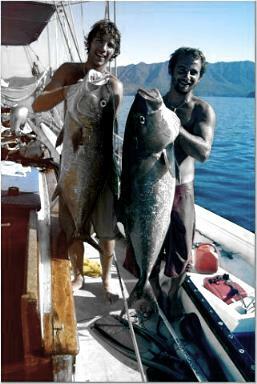 Our means of fishing are trolling and spearfishing, with some bottom fishing now and then, when you don’t have to wait too long. 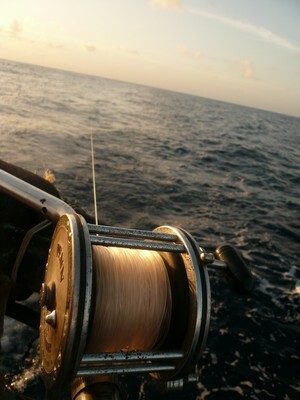 Trolling is done at the back of the boat while under way, usually two lines in the water, towing lures that require speed to be effective. We have reels mounted on the rail with hose clamps, spooled with heavy line, wire leader and either a squid skirt at high speeds or a Rapala at low speeds. 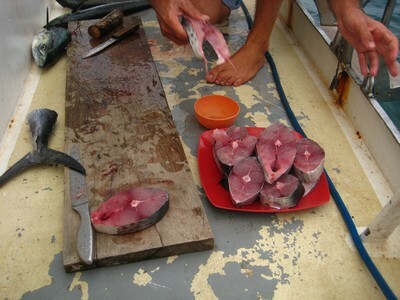 When the fish is hooked, we put gloves on and haul it in by hand as there is no rod to fight it. The gear is big enough that it breaks only when very big fish strike. Trolling like that we are moderatly succesfull. It takes a lot of attention and care in choosing the lures, depending on speed, weather, temperature of the water, etc. We target mainly pelagics, like tunas, bonitos, dorados, mackerels, wahoos, baracudas, trevallys, with the odd marlin or sailfish, that we usually lose. The biggest fish we caught that way was a 40 or 45 Lbs sailfish in the north of Zanzibar. We have to process the fish immediately since we don’t have a fridge. We usually cook it right away or marinate it for a barbecue once anchored. If there is too much meat, we dry it in the sun after having marinated it in oil and vinegar and rolled in spices. We then hang it outside for a couple days and end up with a tasty snack that keeps for a few weeks without smelling fishy. It is close to jerky or biltong, but with fish. It is much better tasting and smelling than asian style dried fish. Sometime, when anchored in a fitting location, we drop a handline over the side at night. We don’t use a reel for that, just a round piece of wood to roll the line, and a pair of gloves. At the end of the line, a lead weight and a simple hook, with a piece of fresh bait, squid or small fish. Tom get bored very fast doing this so we only do it in place where you don’t have to wait. 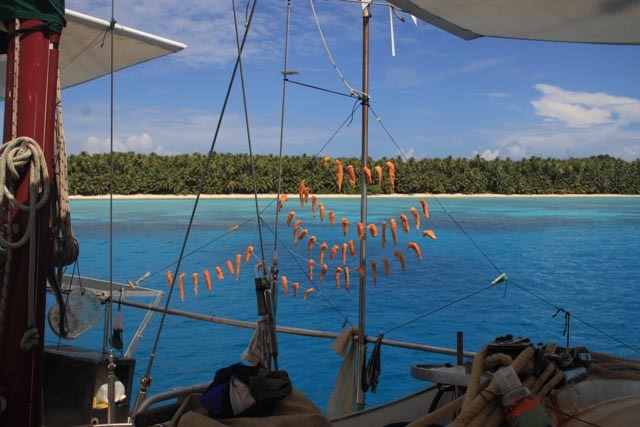 In Chagos it was frequent to start the fire on the barbecue before putting the line in the water, and start fishing when the fire is almost ready, since you were assured to hook up a 10 pounder before hitting the bottom. 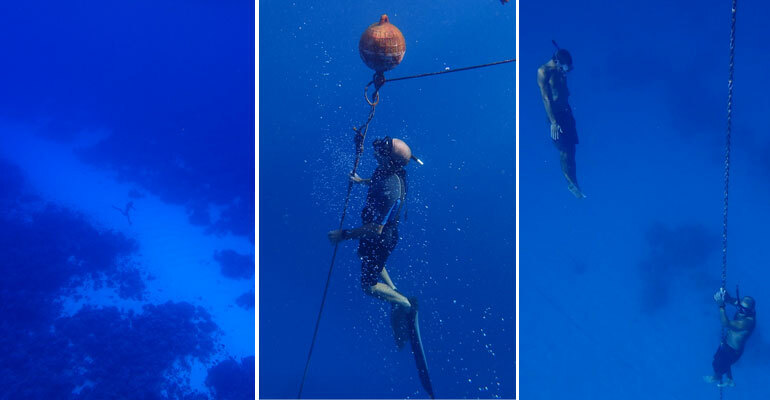 Otherwise, when there is no hassle from the authorities and where the water is nice, spearfishing is the main mean of providing meat to the crew. 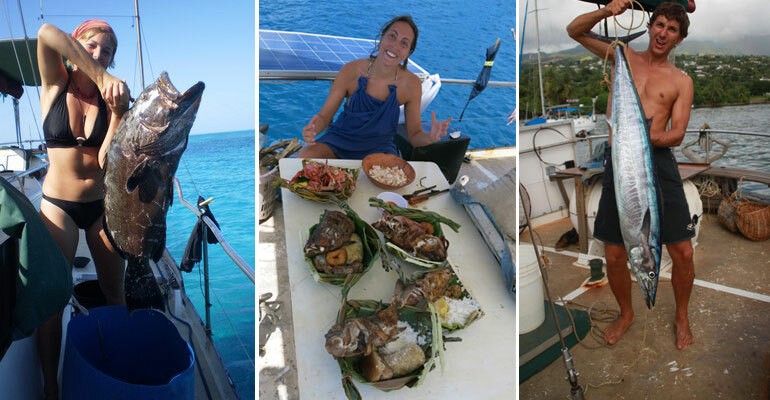 To spearfish we use rubber powered spearguns and hawaian slings, free diving on the reefs drop offs. The species shot like that are mainly groupers, snappers, coral trouts, jacks, breams, and the odd lobster. It is rare but sometime a pelagic will venture close enough to be shot, we landed dorados, baracudas, bonitos and mackerels before. The threat of shark is taken care off by one of the divers, towing the canoe behind him, so we can get the fish out of the water as soon as possible. The shark protector also carry a handspear about 6 or 7 feet long with a sharp bit, and poke away sharks who get too curious. We never had any severe accidents with sharks, but we did have some close calls, mainly in Chagos where the shark population was very active. The real scare was a barracuda encounter in cuba, although barracuda aren’t aggressive, they can get excited when there are struggling fish around and they can make mistakes. One almost killed Tom. Check the story here : Barracuda article . Not related with being bitten by barracudas but about diving, we have to mention that we don’t have scuba gear onboard. It would be great but considering the costs, we won’t be able to afford that for a long time…we’ve got room for storing the gear though, if anybody want to bring its own. We don’t have a compressor but it is always possible to fill tanks in dive shops. 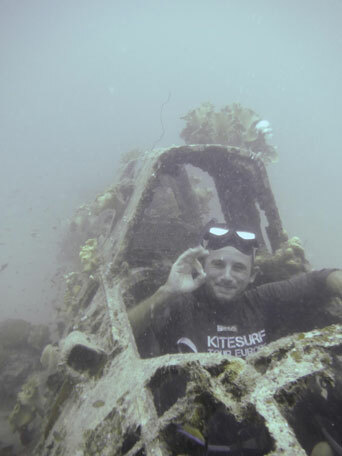 Tom is certified Advanced Open Water with PADI and logged about 75 dives.